Everybody loves maps and you see them cropping up in products demos and pitches wherever you turn. But should you spend the time and resources to add mapping to your Lumira deployment? Will they save time, money or help my users make better decisions? Here are five reasons why maps aren’t just pretty pictures – they are valuable business analytic tool. We all use maps in nearly every part of our lives – whether on a road trip or checking the weather, maps are omnipresent. This means your Lumira users already know how to use and understand the value of maps for consuming data stories. Imagine reviewing 35000 rows of postal code performance data in a grid? It would be difficult to find the key measures that you need without spending a lot of time filtering, sorting or manually searching through row after row of data. A map can represent that same data quickly and easily by highlighting the values of interest – under performers, over performers can be highlighted on the map as well as all variants in between. Heatmaps, Hotspots & Point Clusters were all designed for easy consumption of large data volumes. Let’s again consider our 35000 rows of postal code data. Do you know where each postal code is located? Do you know which ones are closer to major urban centers and which ones are suburban or rural? Maps can easily show you relationships between geographic areas as well as features such as roads, rivers, competitors and more. These relationships can have major impacts on your business. Also consider the case of point data. Millions of data points require not only a location on a map, but they also require aggregation to make sense. Often these points produce logical patterns that don’t follow standard geo-political boundary lines. For example, even within a single postal code customer activity patterns often vary dramatically. It is difficult to even considered these trends until they are made clear on a map. Why are certain customers not coming to a particular location? Why is one particular store performing better than the surrounding stores? Understanding the value and relationships of your business entities and customers is critical to a higher performing business operation. Maps don’t just allow you to spot trends that appear directly in your business data. They can also help you spot problems areas in your data itself. Consider the following map of the North-East sales district which shows a stray ZIP code in the southwest corner of the country. Why is it there? 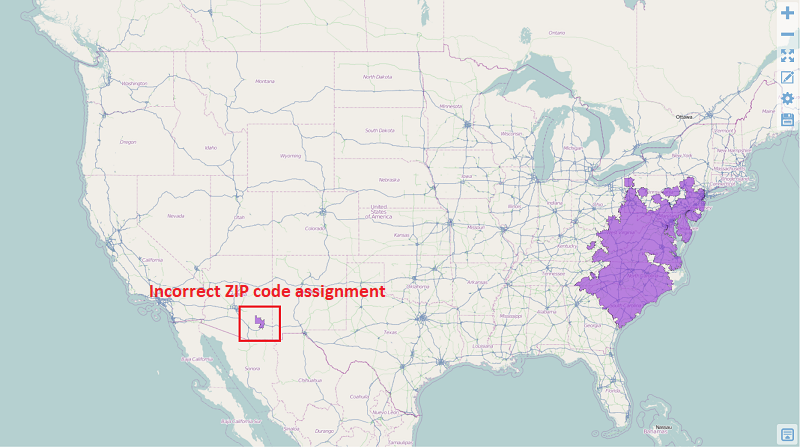 The map immediately shows the analyst that there is a problem with the data – the ZIP code has been assigned to the wrong sales district. These scenarios are incredibly common in production data and create confusion and waste within an organization. Looking at this on a grid, it is nearly impossible to uncover this ‘dirty’ data yet it is instantly obvious on a map. The visualization features we’ve discussed so far are the ones that most people think of when talking about the benefits of mapping, but maps allow users to do so much more. Consider a common store performance scenario: Do you know the effective reach of your business locations? How far are customers willing to drive to your locations? A good location analytics tool can you tell you the answer to these questions. These answers will help with location placements, save money and better target customers through marketing as well as understand product-level consumption geographically. Map analytic features can help you answer these questions through a variety of powerful techniques. Through store catchment or trade area analysis, you can start to answer questions about store performance. For example, we can simply add a layer showing competitor locations to your map. Maybe due to geography or urban drivetime it is easier for customers to reach your competitor than your location. Finally, map users can add even more sophisticated external data such as weather layers. These layers can help users understand how weather affects the business and their exposure to risk when severe weather events occur. Only on a map can you accurately visualize the impact of weather in an area, bring in the appropriate business data for that area, and analyze it in an intuitive way. Because of the visual consumption capability that we discussed above, this opens another dimension to your analysis, the time dimension. If your data includes time information (such as date or time of events), then you can add the time dimension to your maps for even greater insight. Adding time to your analysis can allow you look for trends in buying patterns and isolate them by month, season, or even external world events. Why spend money marketing to customers in an area if they are only looking to buy at a specific point in time or as a result of a specific event? Saving money on your marketing by timing it properly can leave budget to expand your business in other areas. Time is money as they say. Maps are a great way for you and your users to extract additional value from your data sets. They are easier to use, more accurate to interpret and allow users to gain otherwise inaccessible insight vs. traditional grids and graphs. Trying the maps built into out-of the-box Lumira can be a great way to get started. However, for many of the more sophisticated type of analysis and the biggest return on your investment, also consider using one of the great third-party extensions such as Visual Crossing, Galigeo or CMaps. Have you seen ways that your users have used maps to gain insight into your data? Let me know in the comments below!